It was 1977 that Draper Kauffman visited The Learning Exchange, an organization a friend and I had founded. Draper was a futurist and when visiting Kansas City someone suggested he visit the Learning Exchange. We had several hours together sharing our thoughts about how unprepared students were to think about relevant futures for themselves. Draper had been with the Rand Corporation, a futures think tank. He was horrified by the gulf between what was being taught in schools and the world that was unfolding in which students would find themselves. Over dinner with Matt (Taylor) and me, Draper got to talking about how he learned to trick the mind into opening up and allowing itself to play with the future. Draper left the Rand Corporation and secured his doctorate in education, specifically to teach teachers how to engage the future in grades K through 12. He had a hunch and he wanted to run experiments. When working with a classroom of 5th And 6th grade teachers, he handed out as assignment that simply ask the teachers to write the rest of the story. Each handout had a paragraph beginning the story. For all, the task was to make up a story based on this vague first paragraph. Draper left the classroom and retuned about 20 minutes later. Many of the teachers were just sitting, having written very little. Others were several pages into their story. He asked them to share their experience of writing. What none of them knew was that half the teacher’s paragraphs were written in past tense, the other half in future tense. With few exceptions, teachers who had past tense had fun and wrote many paragraphs making up the story as they went along. But those writing future tense struggled imagining a story that was yet to take place. This discovery led Draper to teach his course very differently. Draper began to teach modeling to his students. Most of them had no idea how to create models in their imagination… or how to use models in their thinking processes. To his students, the future was something left to the experts, to be proven right or wrong over time. The future was made up of facts just like in their history books, not possibilities and imagination. And it gave Matt and me an important insight. This is how the axiom "you can't get There from Here, but you can get Here from There" originated. When you begin to frame the future from the present, all kinds of blocks show up. The present is full of the here and now and of many reasons change is not possible. Very little of our school life is composed for facilitating imagination and foresight. It is based on learning facts and facts are only within the past, or the here and now. It is based on test scores and right or wrong. To ease the tension, Matt and I decided that the first paragraph we wrote, from which participants would use as a baseline, would insure success. It would ask participants to remember their success story. Draper's work was an important influencer in the development of our method and process. The importance of modeling, playing with ideas, assuming success became core principles in our work. This morning this article on Peter Drucker showed up in my in box. Drucker was quite good at envisioning THERE and bringing it to his HERE. A timeline of the use and spread of the term "Group Genius"
1980: Inspired by her observations and reflections on her time teaching second grade in the late 1960’s and her exposure to the work of Lawrence Halprin, Gail Taylor coins the term. It finds its way into the business planning documents and collateral of Taylor Associates in the early 1980's. 1997: Fast Company Magazine publishes Group Genius, a feature article on Matt and Gail Taylor and the DesignShop process they created with MG Taylor Corporation (formerly Taylor Associates). 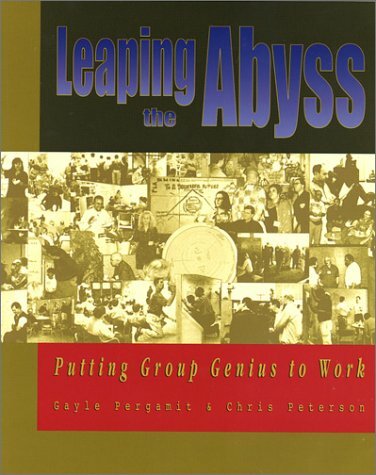 1998: Leaping the Abyss: Putting Group Genius to Work, by Chris Peterson and Gayle Pergamit published by Knowhere Press. This book was the first, comprehensive mass market publication detailing the MG Taylor frameworks, processes and methods. Currently unavailable in print at a reasonable price, the book is available for free online. 1999: The Foresight Institute, where Leaping the Abyss authors were Senior Associates, hosts Group Genius Weekend at the Knowhere Store in Palo Alto, California. This marked the first appearance of the Group Genius logo (pictured below right) created by Christopher Fuller and Claire Arias. 2000: The inaugral "Group Genius Awards" are presented by MG Taylor to individuals, event teams, and NavCenters that exemplify Group Genius in how they work and release creativity in groups. Around 2004, Architectz of Group Genius forms as a design consultancy in Milan, Italy, inspired by the work and methodology of Matt and Gail Taylor. 2007: Group Genius: The Creative Power of Collaboration by Keith Sawyer, a renowned and highly regarded scholar on the science of creativity, is published. So far as we can tell, this is the first public appearance of the term not directly connected with the original usage of the term, though the context and meaning has much overlap. The book has been well received and is typically receives the highest Google page rank when doing a search for “group genius." 2014: The Difference Australia, a subsidary of Pricewaterhouse Coopers, launches a promotional video that appropriates the term, indirectly referencing the Taylor methodology as a core source of their own methodology. Gail and Matt are frequent advisors, educators and co-designers to The Difference Australia team. 2014: Tomorrow Maker Todd Johnston appears at TEDx Livermore and gives a Talk on several of the core conditions that contribute to the realization of Group Genius. Screenshot from Todd's TEDx Livermore Talk via LivestreamNote: The following is the written version of my talk at TEDxLivermore: Uncorking Creativity on September 20, 2014. When the talk is available online, a link will be posted here. To be human is to be creative.. It is in our nature. Unlike batteries, creativity is included in the package. Now, we may each have our own means of expressing this creativity, and our own perception of our creativity relative to other people may vary. And, certainly, good arguments have been made that as we grow up and are socialized into the world, our abilities to tap into and express our creativity may diminish if they are not developed and practiced. But at a fundamental level, whether it is expressed by baking cakes or writing code, painting portraits or snapping selfies, architecting buildings or building businesses, we are all innately and unavoidably creative. And it is this creativity which lies within each of us that has largely brought about and enabled the world we live in, with all of it’s incredible in its beauty, sophistication and capability. And, we have no reason not to think that immeasurable good things will continue to be brought into the world with this creative force. The sum of our creativity is not enough. It is not enough to solve for the kind of complex problems that we, as a species have and will continue to create as a natural course of our lives. It is not going to be enough to solve the challenges that matter most in our organizations, institutions, communities, ecosystems and so forth.. In her recent post, A world without answers, Gail expounds on one of the effects of increasing rates of change and growth in complexity: Answers aren't what they used to be. So how then, as we venture into panarchy, can we utilize the incredible expertise time has accumulated, if not for answers? An effective process through which to put "expertise" is a syntopical reading. Most often (in my experience), this is done in groups, with each person having different books or source material, and taking an hour or 90 minutes to scan and note. However, it can also be an enlightening way of thinking and engaging with ideas as an individual. Create a dialogue with and among the authors. Don't limit them to analysis and critique - let them imagine and galumph with each other's thoughts. Use syntopical reading as a means of getting familiar with someone's ideas and the all important context and situations they rest upon... and then carrying them forward. Engage both imaginative, play-of-mind thinking as well as analytical and critical thinking. Don't set your sights on answers. Rather, seek out clues, and explore the relationships that connect them. I'm using syntopical reading and conversing in this way in a current exploration of paradigm shifts and other kinds of phase transitions. Gail and I recently crafted a paper touching on paradigm shifts in general but more particularly, exploring current history for compelling signs that a significant shift is unfolding, and may be on the verging on a global upcreation to borrow a term from Kevin Kelly. Words - whether exchanged through conversation or composed into a written document - can get us only so far in expressing ideas. Our words are abstractions that live purely in our heads, and rely upon shared, implicit assumptions of what they mean and represent. Get out of your heads and put your hands to work! Use any physical materials you have available and build a three-dimensional model of your idea. Make it as detailed and explicit as you can - bring the idea that lives in your head to life in the space where your working. Our are typically outfitted with “modeling kits” for just this purpose. These may include items such as clay, foam, wire, string, construction paper, popsickle sticks, egg cartons, wooden dowels, straws, sacks, glue, tape, and all sorts of other odds and ends. In our view, no social or group meeting space is complete without resources and tools that enable 3-dimensional model building. This is the fourth in a series of Spark Cards being published to the Tomorrow Makers Journal. Having doubts about an idea? Do you see gaps, oversights, unsound assumptions? Is there an elephant in the room that no one is talking about? Take 10 minutes and storm a WorkWall (or whatever whiteboard you have available) with all the reasons the idea in front of you just won’t work. Don’t try to refute or defend your reasons - just let them all pour forth. After you’ve exhausted your selves of why it won’t work, step back and take a look at all the reasons you've listed. Cluster them into groups of likeness & similarity. For each cluster, what are the underlying assumptions and reasonings? Which are rooted in fear - fear of the unknown, fear of change, fear of what other people may think or do? Which of these clusters are within your power to change? This is where to focus your energy - turn these ‘reasons for failure’ into design specifications for success! This is the third in a series of Spark Cards being published to the Tomorrow Makers Journal. Humor plays a huge role in our ability to solve problems. When two or more ideas come together in an unexpected way, they can cause surprise and delight -- our minds reframe. Humor can help us realize totally new emergent ideas. Jokes are a good example of this, where two seemingly conflicting ideas come together and are resolved by "getting the joke." At the moment you get the joke, the tension from the initial conflict dissolves in laughter. Take a few minutes and share some jokes with each other. Now, take a few minutes and create some jokes about the ideas you are playing with. This is the second in a series of Spark Cards being published to the Tomorrow Makers Journal. First, to answer the question, "What is a Spark Card?" A Spark Card is a tool for perturbing imagination, furthering ideas, and seeing with fresh eyes. Gail and I began developing them for our Collaboratory at Sonoma Mountain Village that we share with the Livability Project. We have a set of 12 and have sketched out as many more. Spark Cards are part of the Collaboratory’s way of working. With this post, we'll begin publishing them in journal form. Look for a downloadable deck in the near future. These cards can help you facilitate yourselves -- a task which is often very difficult. Even high performance teams and groups get so focused on immediate tasks at hand that they forget to reach out, to explore an idea from different vantage points. Think of Spark Cards as a Creative Whack Pack for collaboration. Use them to begin your meeting, or at a point where you feel stuck or stale. They can also help you take a last look at your work. They serve as a check to what really matters about your enterprise and the immediate next steps. In our haste to succeed with deliverables and goals, we tend to race to the finish line. These Spark Cards are meant to entice you to “make haste slowly”. They have been proven to save time and enrich the products and services being developed. Happy perturbing! May you have meaningful, rich, worthy conversations! "Put people in an open system and they will automatically want to contribute." The Starfish and the Spider is a new book that adds to the growing body of knowledge about leadership, collaboration, and emergent organizational design. The bi-line is The Unstoppable Power of Leaderless Organizations. To me, this book speaks of Sapient Leadership. The book is interesting because it reinforces the reality that design, creativity and collaboration are natural to human beings. It compliments our own Value Web model. I speak of my experience with young children in my blog on Group Genius. What the authors of the Starfish and the Spider reinforce is the natural tendency of people to play ... to tinker with ideas, to find a difference, and to add to the stockpile of ideas. Indeed, it seems to me that examples in the book are child's play ... Wikipedia, E-bay, Internet, P2P sharing, open source, etc. ... wonderful child's play! Over the last twenty-five years, there have been a number of overlapping descriptors of the economic systems in which businesses live. Regional and global economies have moved through the Industrial, Informational and Knowledge Economies to the Network, and now into the Creative Economy. All of these shifts have been rapid and each has incorporated and built upon – but certainly not eliminated – the previous ones. This shift paper is written not as a wrong way/right way to think about and do business, but rather as a way to have a dialog about our assumptions and ways of working in order to increase our fitness for the kinds of situations, decisions and responsibilities that a Creative Economy imposes on us. In this spirit, we thought it would be fun to list the "emerging patterns" of organization we identified in the shift paper, using them as a source from which to link to ideas, conversations, illustrations and other examples of these patterns in the world around us. Some of these may be familar to you, but hopefully we've uncovered a few new discoveries, as well. Tucked near the back of the July issue of Wired, there is an article about two types, or classifications, of creative genius: conceptual and experimental. The article focuses on the research findings of David Galenson, who in 1997 "almost by accident" happened upon an observation which turned to curiosity turned to hypothesis and ultimately into theory. The creative class of conceptualists figure out what they want to create before they set out to create it. "The hallmark of conceptualists is certainty. They know what they want. And they know when they've created it." The vast majority of conceptualist geniuses, according to Galenson's research, peak at a relatively early age or stage in their careers, most often twenty- or thirty-somethings. Experimentalists are tinkerers, forever approaching a realization of an idea, never quite knowing when their work is finished. Coming to knowing rather than knowing. They are typically late-bloomers, producing their best work after years of playing with ideas, tinkering, toying, tweaking. Is it possible to think of organizations, communities and even civilizations in these terms?